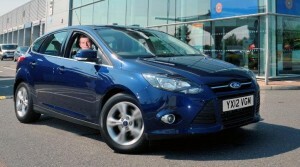 It’s a sign of the times but Ford’s new Focus EcoBoost accounts for one in five of its new car sales. As we’ve said previously the 1.0 litre motor sold nearly 1,000 units in April and when you take the European sales figures into account it makes up nearly a quarter of its total sales. That’s an astonishing success story and bodes well for the firm. The Ford Focus looks set to dominate the sales charts in the months to come as people look for cars which are cheaper to run. It’s a decent enough car and the EcoBoost turbo-charged, direct injection engine is Ford’s smallest. Yet it delivers the performance of a conventional 1.6-litre engine with improved fuel efficiency and lower CO2. The EcoBoost is class-leading in fuel economy and CO2 emissions in the C-segment for petrol-engine vehicles. Ford is so planning on extending the EcoBoost availability to its B-MAX and C-MAX ranges later this year. Incredibly, around 60 per cent of people who take one for a test drive actually buy one – according to an Essex dealership. With people looking at boosting their eco-credentials and with the price of fuel up and down on a regular basis, you will be seeing lots of these cars on the roads by the end of the year. This entry was posted in News and Views and tagged Aston, caption, car, Europe, ford, ford focus, Ford Focus Eco, ford focus eco-boost, Ford sales, fuel economy, fuel efficiency, GM, LS, MoT, new car sales, price by Steve Lumley. Bookmark the permalink.